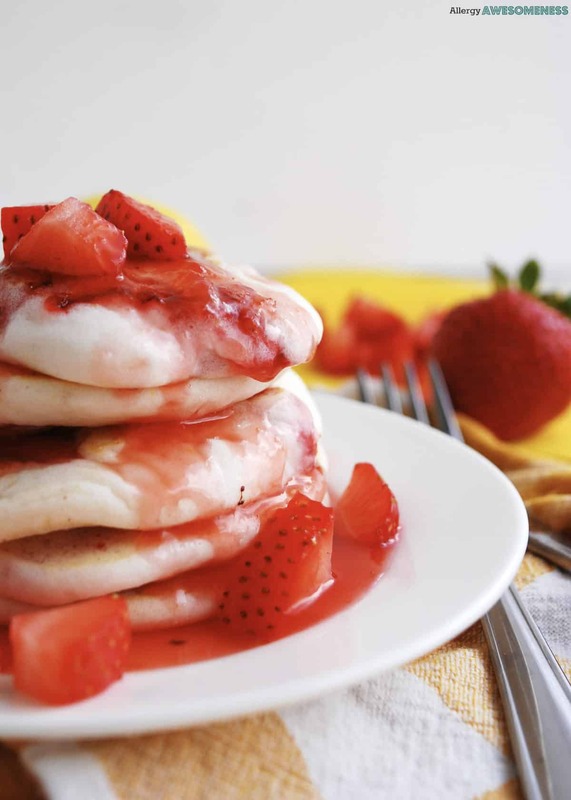 Soft, fluffy strawberry pancakes studded with fresh strawberries and a touch of lemon, drizzled with homemade strawberry syrup are the BEST way to start off your summer morning. Plus, these can feed just about anybody as they’re free of gluten, dairy, egg, soy, peanut, and tree nuts. They’re vegan and top-8-free too – though you’d never know it! My friend Megan is here today sharing the most delicious strawberry pancakes with us. She is queen of allergy-friendly cooking and I’m so excited for you to get to know her (and her recipes) better. Enjoy! 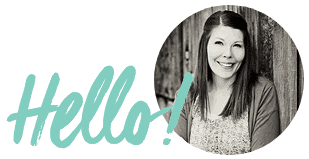 I’m super excited to guest post for Melissa! I’ve followed her blog for a long time and feel a kindred spirit in wanting to make wholesome food for my family. She was telling me that many of her readers also enjoy recipes that are free of gluten or some of the other top allergens. Since this happens to be my specialty, I was more than happy to share one of our favorite recipes with her. Both of my sons have multiple food allergies, and darn it – I’m too much of a foodie and WAY too stubborn to give up good food. So, like a mad scientist, I’ve taken to the kitchen and figured out how to re-create some of our favorites. A classic and STAPLE in my house is pancakes—not only for breakfast, but it makes a frequent appearance at dinner, as well! So, I figured out how to make those classically soft, brown-on-the-top pancakes that no one would guess are free of food allergies. And, you know what else makes these fun? They’re using the culinary world’s most recent buzz ingredient: aquafaba! That’s right, aquafaba provides that fluffy, egg-white type foam that really gives these a light, pillowy texture. And now that it’s summer, you hopefully have time to be trying new recipes too! Start with this one – you won’t be disappointed. Lazy summer mornings are the best. It’s great to wake up with your kiddos and not feel rushed to run out the door. If you have extra time, why not make something extra delicious? 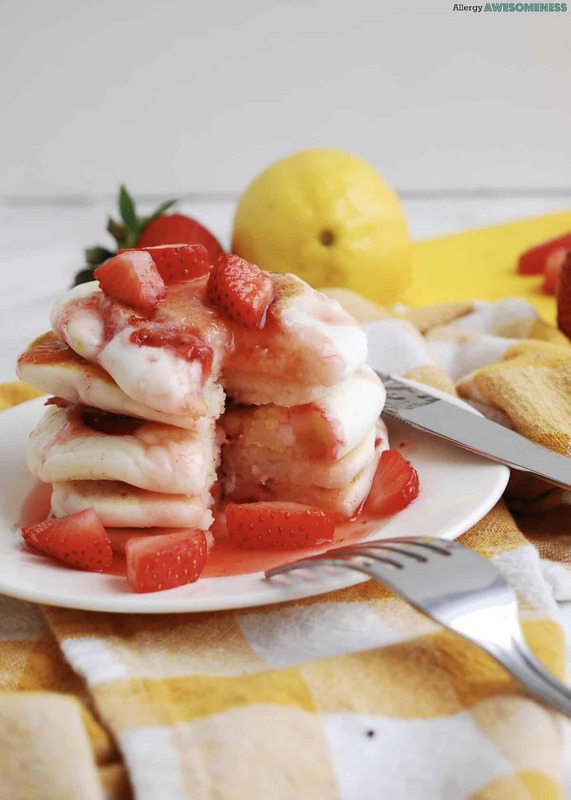 I’m a pancake-a-holic, and so I’d be happy with just my regular pancakes—but since these strawberries keep jumping into my cart at the grocery store, I wanted to add that pop of color and juicy taste of summer. To round out the sweetness of the strawberries, I use some lemon zest and lemon juice to add just the right touch of sweet plus sour. So, Strawberry Pancakes were born. 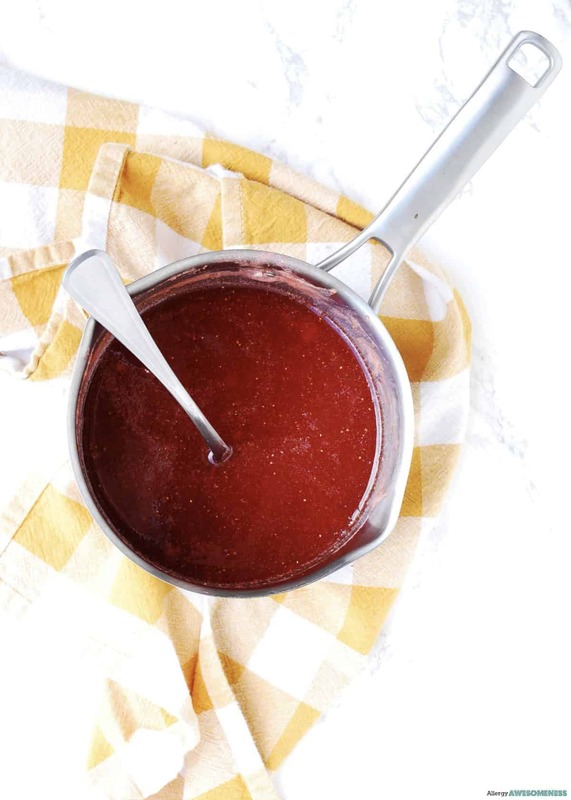 You’ll also love this simple to make, yet wow-inducing strawberry syrup. It blows any store-bought strawberry syrup off the shelf. Seriously. I have kept the leftovers to drizzle on top of a million other things. There really is no wrong way to go here! Ice cream, french toast, or a spoon. Feel free to half the recipe if you don’t want to be tempted with leftovers like I have been. Grab your griddle, grab some strawberries, and make this a breakfast you and your kids won’t soon forget. You never know— allergy friendly strawberry pancakes may just become your new, favorite summer tradition. First, whisk the rice milk and lemon juice together and set aside. This will be your faux buttermilk. In a separate bowl, combine the flour, baking powder, salt, and xanthan together in a medium bowl. Give it a few whisks to mix it all up and set it aside. Drain all the liquid from the can of chick peas into the bowl of a stand mixer. Add the ½ tsp vinegar, and turn it on. Let it mix on medium at first, until it stops splattering and a white foam forms, then on high speed until it’s nice and firm and glossy. You should be able to hold the bowl above your head, upside-down. Once your foam is strong, pour in the ¼ cup of sugar and mix a few minutes until no longer gritty. Slowly pour in the oil over the course of about a minute while the mixer is still on high speed. It should incorporate fully, with absolutely no deflation of the foam. Once it’s in, let it go another 30 seconds. Next, pour the rice milk mixture that you set aside in step 1 into the dry ingredients and mix until just incorporated. Once the wet and dry are combined, fold in the foam/emulsion mixture. It will be nice and bubbly. Fold in the strawberries. Ladle onto a warm, greased griddle and flip once the bubbles start popping, just like regular pancakes. Remove from griddle once both sides are golden. While the pancakes are cooking, take the strawberries, sugar, water and vanilla and put in your blender. Pulse until you reach your desired consistency (I like mine completely smooth). Pour the mixture from your blender into a small saucepan over medium-low heat. Cook until the sugar has dissolved. Depending on how runny you like your syrup, you can continue to cook it until it reduces down. Taste the syrup and add in the honey/agave for more sweetness. I find my berries are often sweet enough. If it is in fact too sweet, you can add in some lemon juice to tone it down. 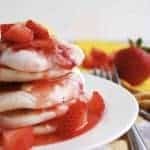 When the pancakes are done, serve with additional fresh strawberries on top, and the warm syrup drizzled over it. Megan blogs over at AllergyAwesomeness.com. After her son was diagnosed with multiple food allergies, she had to decide to just eat rice the rest of her life, or re-learn how to cook with allergy-friendly ingredients. 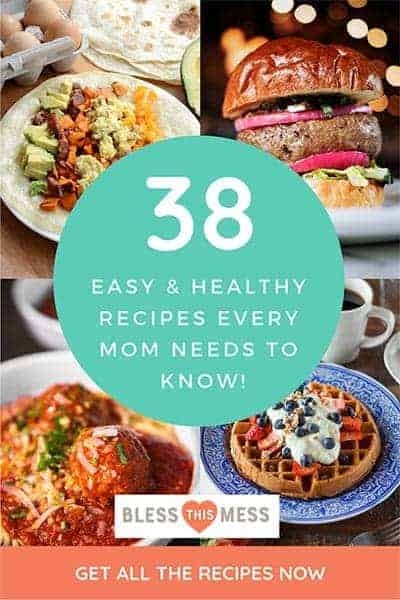 She wants to spare you the time it took her to figure it all out, and share all of her re-created recipes. Her motto is: Give up ingredients, but don’t give up awesomeness. Follow her blog, Instagram, Facebook or Pinterest. I totally agree, I’ve been seeing aquafaba around but need to try it too. Who thought of such a neat idea! How fun and wonderfully pink are these pancakes!? This looks like a fantastic way to jazz up the classic version – thanks so much for posting these! These pancakes sound absolutely delicious! A perfect breakfast!